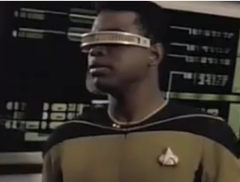 It always comes back to Geordi. Congratulations! You can afford to shell out $1,500 for a cyborg-ish computer that sits on your face. But you say other bars aren’t so accepting of those pricy Google Glass specs? Here’s a free drink, not that you can’t buy your own, person who owns a facecomputer. Or heck, maybe you’re tapped out now and could really use a complimentary cocktail. In what sounds like the kind of deal FourSquare users used to unlock back when there were physical rewards for such a thing, a boutique hotel in the Nob Hill section of San Francisco is giving out a complimentary drink to anyone wearing Glass at the lobby bar, reports the San Francisco Chronicle. This is a bit of change from other bars that have banned Google Glass either for fears of unapproved recording, as well as an incident in San Francisco where a woman claimed she was attacked at a bar for wearing the specs. The hotel bar’s general manager said the business especially wanted to show support for techies after that altercation. “We thought why don’t we invite people who wear Google Glass over here,” he said. In order to cash in, as it were, Glass wearers will have to muster up some social media currency by way of either taking a photo of the hotel or their drink and posting it to Facebook, Twitter or Instagram with a designated hashtag.